You might recognize this face, but he's changed quite a bit since the last time you saw him. Mr. Hayden is now a whole 9 months old! 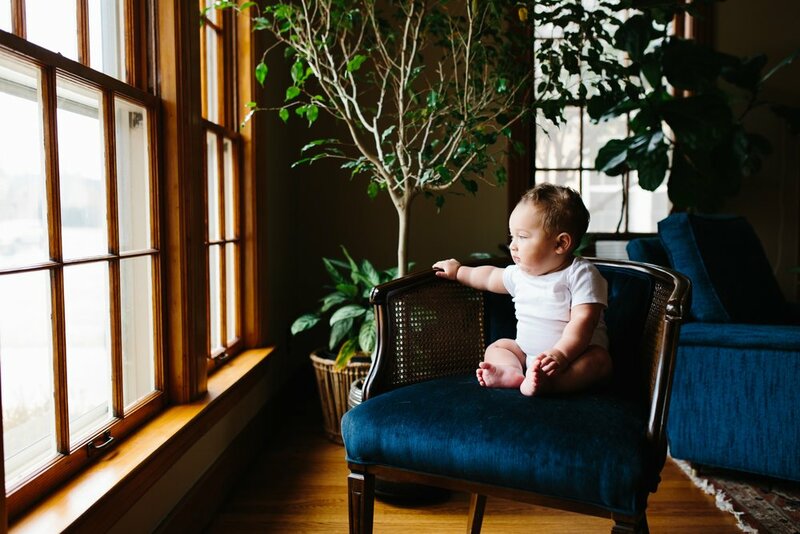 His parents Karina and Craig opted to do his 6 month milestone session at home just like his newborn session last year and I couldn't have been more excited. Lifestyle photography in the home allows people to capture precious moments that normally fly by and exist only in memory. Six months may not seem like a long time but homes continually undergo major transformations as baby grows. Bouncy seats are replaced with high chairs, little plates and sippy cups join the bottles in the cabinets. Gates appear in the doorways and covers adorn each outlet. Life with babies can be chaotic, but it's also beautiful. Just look at how Hayden looks at his daddy while he and his mom are cuddling on the couch. You can scroll I'll wait... Am I right? I mean, come on! The amount of love and contentment in those eyes is absolutely immeasurable. In home sessions also allow for a higher level of spontaneity. Karina mentioned while I was there that she wanted to get pictures done in the bathtub sometime because he was such a water baby and loved bath time. I said, "Why not now?" so we ended the session with him in the tub! I'm so excited to share this session with you all, because it's truly one of my favorites!! I'm suuuper excited to share Tara's maternity session today! I first met Tara at a newborn workshop in Tulsa a few years ago. Shortly after we discovered that we lived within just a few miles of each other (and shared a flair for sarcasm), we became fast friends. Fast forward a few years and she is now snuggling her sweet baby boy! 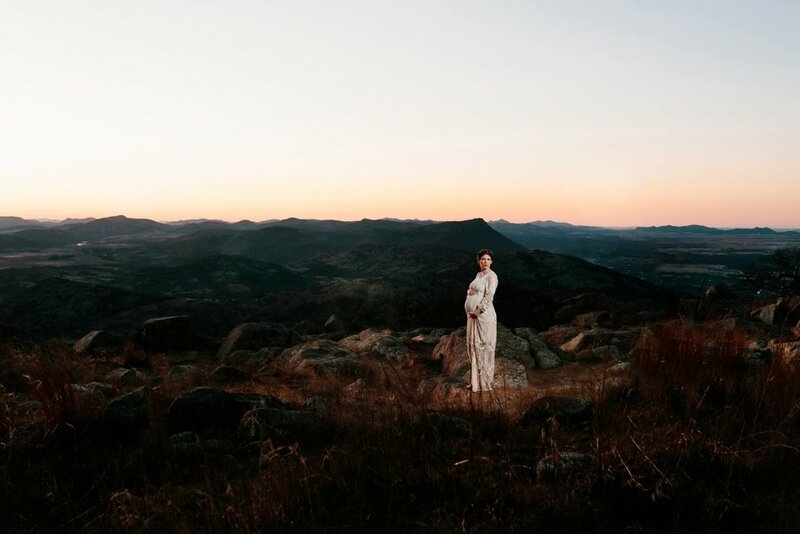 I was honored when Tara asked me to take her maternity photos, and thrilled when she decided on the Wichita Mountains! Even though we're both deathly afraid of heights and laughed about that on the way to the session, we survived. Whew. Tara jokes about her awkwardness, but I've photographed her a few times now and she's flipping stunning every dang time! But don't take my word for it, let the photos do the talking! I don't know about you, but I think this winter has dragged on long enough! I'm wanting to thaw out a little bit so I'm going to take you back in time to the fall where the colors AND temperatures were a little warmer. I was invited to photograph Baby Margaret and her family at their beautiful home in Weatherford, Oklahoma. (I never mind traveling for work, but when I found out there was a Quiznos close to their home I was like YES. I miss Quiznos, y'all.) Big sister Nellie was enamored with her baby sister and I'm sure they will grow up to be thick as thieves! I always ask if parents have any special heirlooms they'd like to include in the photos, and it's so fun to see what they include! We photographed baby Margie next to a portrait of her namesake, as well as both sisters with a painting by both of their namesakes. I love it when names have meaning behind them, especially when it's given to honor the legacy of a special person in that family's life.